I think I mentioned before how much I dislike Softball. Yep I really do. I’m not good, at all. I can’t hit. I run when the ball is hit and then get out because I got caught between the bases. Or I am out because I did not run when the ball was hit because I thought it was going to be caught so it gets backed up because of me and I get out. Even now writing this confuses me. Either way I go because I like to take photos, grill, and hang out with Price, who plays on my office’s softball team. 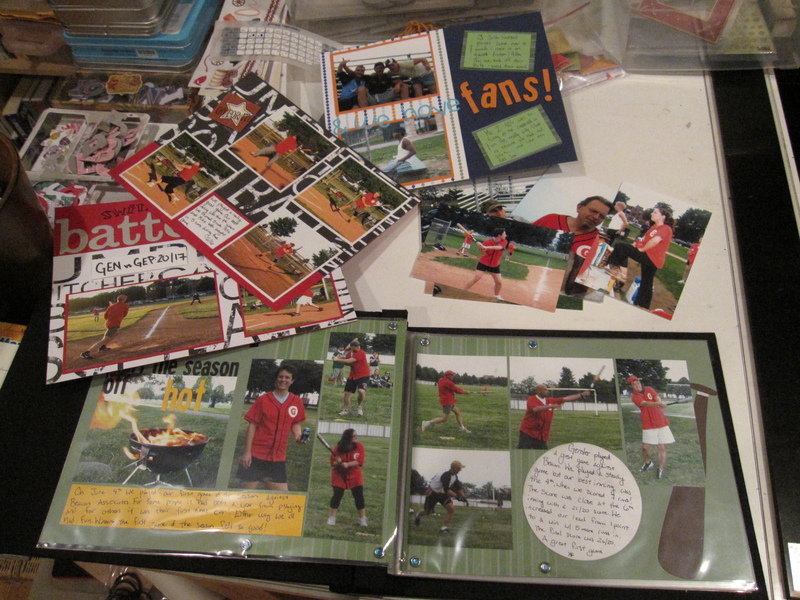 So I now have all these photos to scrapbook from this past season. Slowly but surely I will get it done! Well things will be even faster now that I have Stampin’ Up!’s My Digital Studio. I made a page (see below) tonight of photos from a game we played in August. I love this program. It’s user-friendly and has a great database of templates, kits, papers, embellishments, fonts, stamps, etc that can be applied to pages, calendars, cards, etc. I know that I will be using this more and more in the future because I like SU! products and I want to get into digital scrapbooking. This program is a good introduction into digital scrapbooking while keeping things familiar since I know the SU! color families, stamps, embellishments, etc. I like using Photoshop for altering photos (such as actions) but My Digital Studio is good for simple things like cropping and resizing, mirroring, flipping, and rotating photos. Plus it does have some alterations like red/blue/yellow tone, lighten, darken, inverse, etc. In fact I darkened all the photos in MDS for this layout. While I know the layout is really simple but the overall look to the book is simple- quick and simple. Plus this is just the tip of the iceberg with the stuff that this has to offer. Sorry for the praises but I’m so excited that I did not end up yelling at the computer for not being able to resize the photos. My Digital Studio is $79.95 (plus taxes and shipping) if you have questions or are interested in purchasing it just leave a comment and I will email you back. 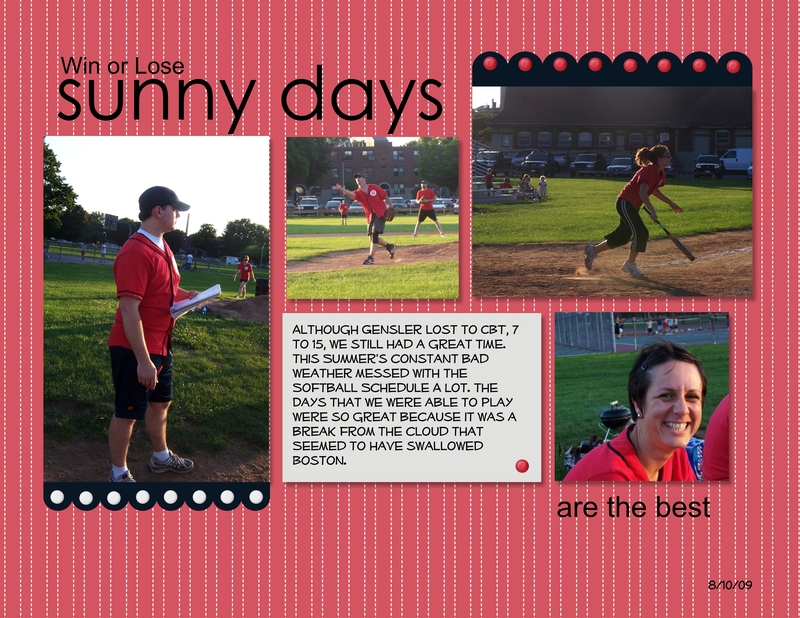 Filed Under: Scrapbooking and Crafts Tagged With: digital scrapbooking, My Digital Studio, Photos, softball, Stampin' Up! Your layouts look great, i’m envious, cuz i never have a completed anything! I saw you just got your convertable! Ups said 2- 3 days! I also found the grenn headband, so i will send that out to you!